It's a curious thing, my sense of reason. For a couple of years now my life has been buzzing with crafty whims and projects; hats, mitts, scarves, sweaters for the dogs, along with little toys and what-nots, knitting, beading, cross-stitch, felting. In fact, it's been so busy that I finally decided I had enough interesting little things going on to support a blog. Curious though, because just as I begin blogging about all of it, I'm settling in to two time-consuming and complicated projects. I have no wonderful finished creations for you. Can you see? There is more of her kimono. See? Just there, at the bottom. No? Well, believe me it's been a ton of work. And the cardigan? Well, I'm still working on that first sleeve. Can you see? 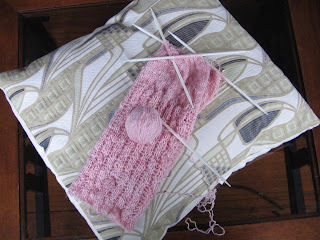 I'm past the ribbing now and working on the stocking stitch. It's coming along. Slowly. However, I suppose I have finished one small item. A little snail to go with my turtle. Fittingly, a snail and a turtle reflect the pace of my two larger projects. On an unrelated note, I have to offer birthday wishes to a family member. 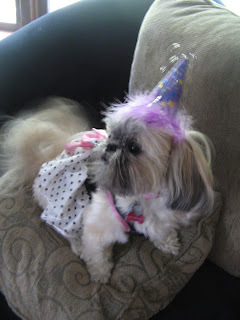 Happy Birthday Whimsy! Two Years Old Today! Hip, Hip, Hurrah!